I didn’t know how to respond, was this a bad thing? “I’m sorry,” was my immediate response (although I really wasn’t). Oh. So apparently bacon overrules apples in my house. Who knew? Anyway, the reason I was cooking with bacon again was because we wanted twice baked potatoes for dinner. And to be honest, I only really knew what they were from the frozen food aisle and had a faint notion on how to do it. So with a working theory, I whipped up what turned out to be an amazing side dish – with some casualities along the way. Turns out scooping out the insides of microwaved potatoes is a bit harder than I expected. After the fourth attempt, I was making mini canoes instead of ripping apart the skin and losing what was meant to be the “bowl” for the remixed insides. 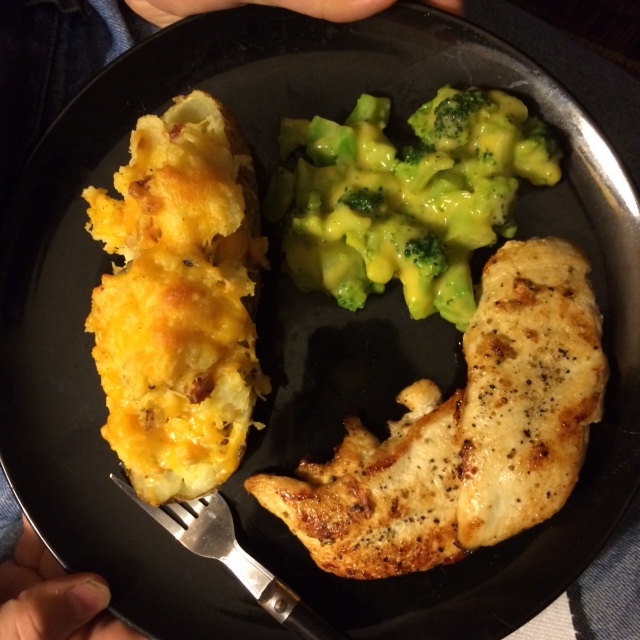 Basically, a twice-baked potato starts with a regular spud. Microwave it until it’s soft, then cut it in half and scoop out the insides, leaving enough of it left to serve as a bowl. Mix the insides with shredded cheese, crumbled bacon, black pepper, garlic powder, and a splash of milk. You basically have mashed potatoes. Spoon it back into the potato skins – it’s ok if you spill over – and cover with a sprinkling of cheese. Put in the oven to bake and voila! Twice baked potatoes. Preheat oven to 350. Microwave potatoes until soft, about 8-15 minutes. Cut in half. Scoop insides of potato out, creating a “bowl” and placing potato insides into a large mixing bowl with 1/2 cup of cheddar cheese and bacon. Set “potato bowls” in a glass baking dish. Stir bacon/cheddar/potato with margarine, milk, and black pepper and garlic powder to taste. Once mixed, scoop back into potato “bowls” and sprinkle top with remaining cheese. Bake in oven for 15 to 20 minutes, or until cheese is melted and top is slightly crisp. Let cool for 5 minutes, then serve. Yummm! Love bacon with potatoes!